At the front of their Putney SW15 property, these café style, made to measure plantation shutters provide privacy from the neighbours and a soft window covering allowing the natural light from this leafy London Borough of Wandsworth to filter through. Putney SW15, one of the 35 major centres in Greater London, is well known for its open space and clean air. It boasts countryside charm, with city spirit. The heart of this area is full of period homes mostly dating from the 19th century, with the west’s handsome houses and apartments nestled in Putney Heath and the east’s magnificent detached homes conveniently located near to transport amenities. These London properties are ideal for made to measure domestic window shutters. An affluent area, with property commanding higher than average London prices, Putney SW15 has become one of London’s most highly desirable places to live, where many homes are fitted with made to measure window shutters. Many residents are choosing to renovate their homes with made to measure plantation shutters like this Putney shutters customer rather then move, settling into the area and creating comfortable family homes. This Putney SW15 property is situated on a peaceful residential street close to Putney Station, providing an underground tube service straight into Central London which has attracted many young professionals to the area. 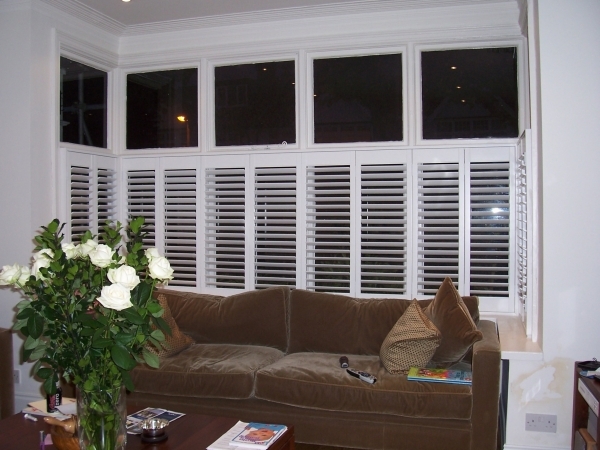 These customers were recommended Shutterly Fabulous by their who recently had shutters fitted in Balham SW12. This made to measure window shutters customer opted for café style shutters, half height to allow the period stained glass to remain a prominent feature. Their made to measure plantation shutters are in a warmer cream tying in the soft furnishings of their room. Curtains would have crowded their window, breaking away from the more modern lines and styling of their room.With Shutterly Fabulous having already fitted their traditional range of made to measure plantation shutters and their unique designer collaboration of window shutters in many homes, the plantation shutter has never seemed so stylish! If like this window shutters Putney customer, you would like the same stylish SW15, London made to measure window treatment, please contact the team for an ultra competitive window shutters cost.